If you’re Lemon Oreo lover, this this creamy fluff salad is for you! 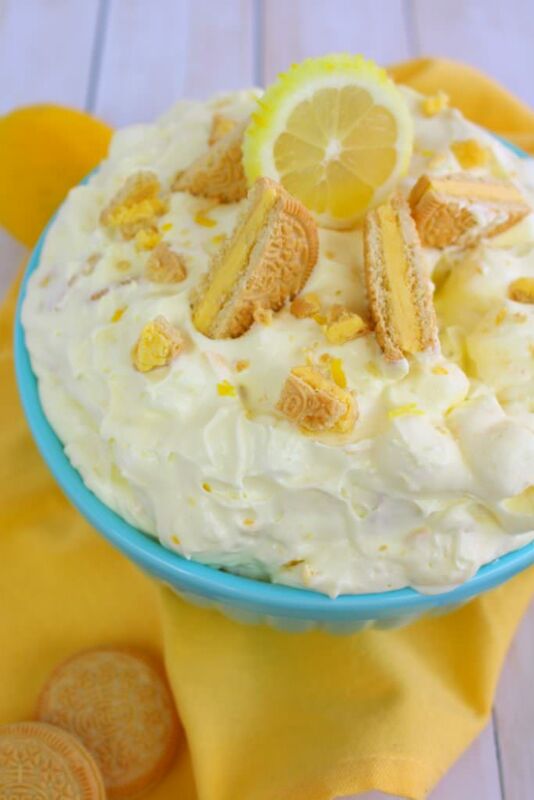 Like the classic oreo fluff recipe, this version is made with lemon oreos and lemon pudding. 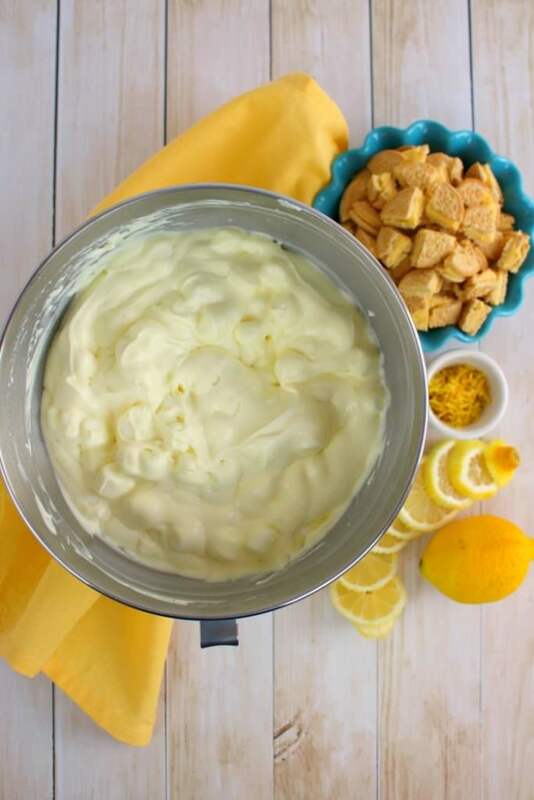 No potluck, picnic or cookout, is complete without a sweet, creamy fluff recipe like this! 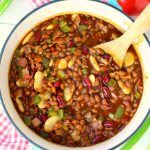 Growing up in rural South Dakota I took part in many, many pot luck dinners, luncheons and suppers. It was an amazing way of gathering the community to dine together on some wonderful food and enjoy the company of everyone involved. 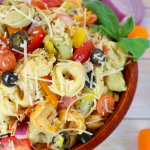 At these pot lucks, there seemed to be some unspoken rules that everyone abided by; first, the dish you brought was always homemade. There was never really anything store-bought, other than maybe a few bags of chips that would be accompanying a homemade dip or appetizer. The second unspoken rule was that you always brought enough food to feed your family. 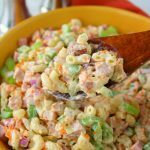 This often meant that people would bring at least a couple of dishes – perhaps a hot-dish and a salad or a big pan of fried chicken and a dessert. With these unspoken, yet often unbroken rules in mind, the variety of food at these feasts were pretty spectacular. 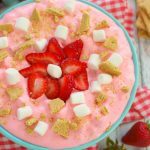 One of the many dishes that was always present was a delicious, sweet “fluff salad.” This type of dessert/salad seemed to always be a hit with kids to grandparents, and was typically one of the first dishes to disappear. 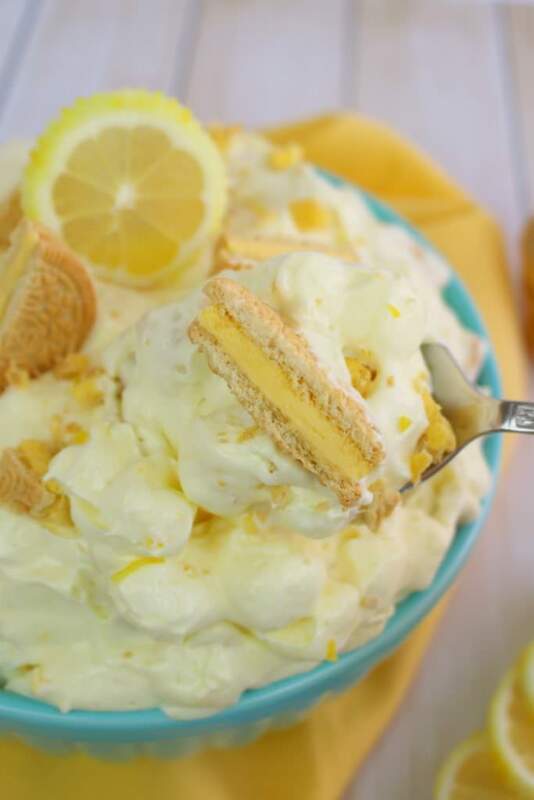 My Lemon Oreo Fluff Salad would not only qualify as an amazing pot luck dish, but would be a dish that quickly transformed into an empty bowl. To make this simple Oreo fluff recipe, you’ll start by mixing together the creamy base of the salad. This starts with cream cheese, powdered sugar, lemon pudding mix, milk, a container of whipped topping and mini marshmallows. I use my stand mixer (or use a hand mixer), which makes the process really easy, quick and effortless. Once this is mixed together, chill the creamy base for at least 2 hours. This will help the base set up nicely, and become more firm. 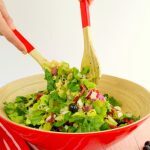 While the creamy base of the salad is chilling, it’s a good time to chop up the lemon Oreo’s and grate the lemon zest. I quartered the Oreo’s, however, feel free to chop them any way you wish. I like to wait until the very last minute to add the cookies to the salad, as it ensures the cookies stay a little crisper once served. 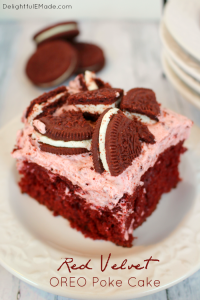 Just before serving this amazing fluff, add the chopped Oreo’s and lemon zest to the creamy base of the salad. Stir together well. Step 4: Transfer to a Serving Bowl, Garnish and Enjoy! Once everything is mixed together, the Oreo fluff is ready to be served. Transfer to your serving bowl of choice, and feel free to top with additional Oreo’s, lemon zest and even some lemon slices. 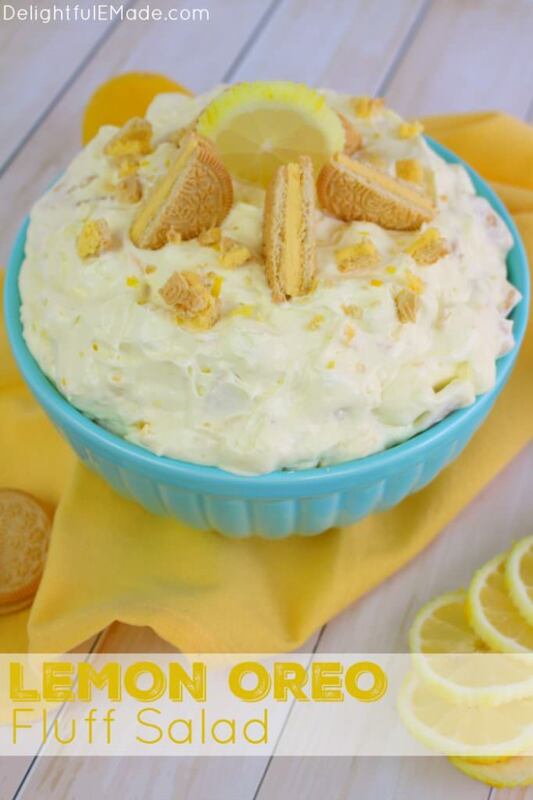 It makes for a very pretty presentation, and if you’re serving this side dish at a pot luck, the topping will give people and idea of what the salad actually consists of – Lemon OREOs!! If you're Lemon Oreo lover, this this creamy fluff salad is for you! 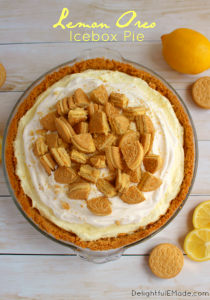 Like the classic oreo fluff recipe, this version is made with lemon oreos and lemon pudding. 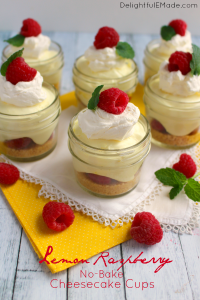 No potluck, picnic or cookout, is complete without a sweet, creamy fluff recipe like this! With a hand or stand mixer, cream together the cream cheese and powdered sugar. Mix until smooth and creamy. 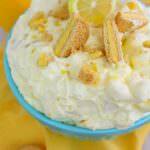 In a seperate bowl whisk together the cold milk and pudding mix. Whisk until completely combined and slightly thickened. With the mixer running on the lowest speed, slowly and gradually add the pudding mixture to the cream cheese mixture. Mix until smooth. Fold in the whipped topping and mini marshmallows. Chill for at least 2 hours to help the salad set up. 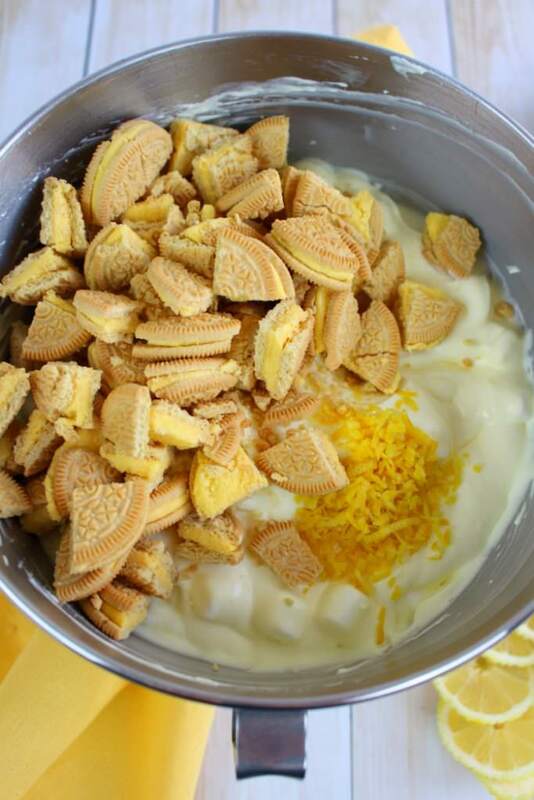 Just before serving, fold in the Lemon oreos and lemon zest. Waiting to add the oreos until just before serving will help ensure the cookies stay crisp. Garnish with additional Lemon oreos, lemon slices and lemon zest, if desired. Try adding fresh berries, like strawberries, raspberries or blueberries for additional flavor and texture. Mmm...I wish we had lemon Oreos in Canada, this looks delicious! 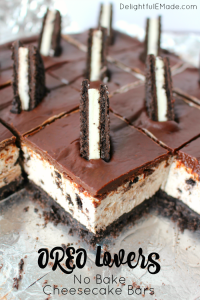 Thank you for joining The Creative K Kids' Tasty Tuesday linky party – I can't wait to see what you share next week! 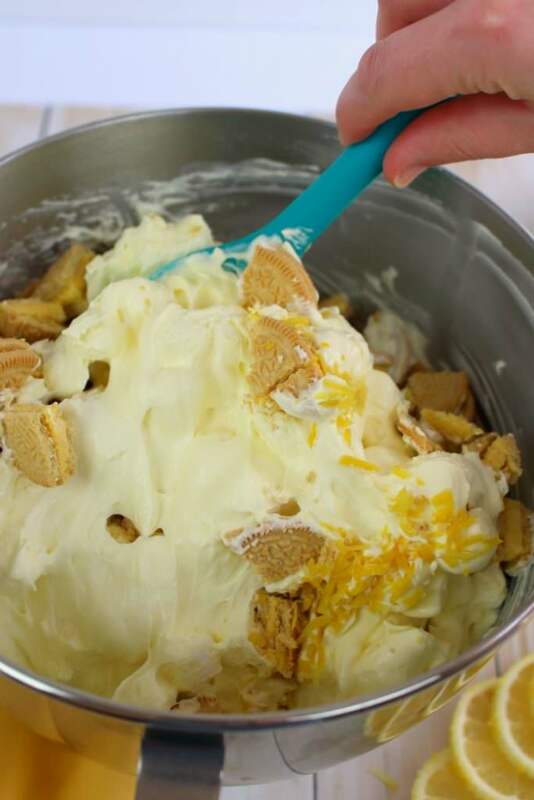 Your lemon oreo fluff looks delicious! Can't wait to try it. Thanks for sharing at Snickerdoodle. Pinning.